Hammertoe deformities arise from a muscular imbalance in the foot, resulting in contracted toes that are often painful in shoe gear. Diagnosis is made clinically with observation of sagittal plane contracture of a digit at the proximal interphalangeal joint. Diagnosis is further confirmed with simple radiographic imaging of the foot demonstrating this contracture. 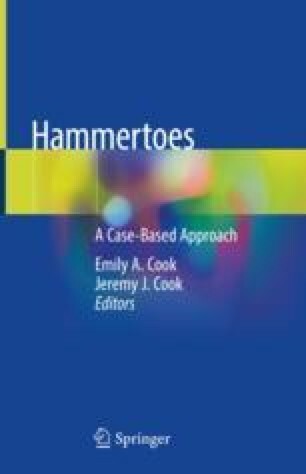 Surgically, hammertoes can be treated with a variety of procedures described in the literature. The peg and hole proximal interphalangeal joint arthrodesis technique was first described in 1983 by Schlefman. The arthrodesis involves fashioning the head of the proximal phalanx and the base of the middle phalanx into a peg and inserting into a fashioned hole, respectively. This surgical technique allows for good osseous contact and stability in all planes (Jones et al., J Foot Ankle Surg 41(6):414–416, 2002; Lamm et al., J Am Podiatr Med Assoc 91(7):331–336, 2001). The construct of this arthrodesis is inherently stable and particularly useful in an elongated toe, where significant shortening is desired. The most common complication of the procedure is the fracturing of the dorsal cortex of the proximal phalanx, resulting in the middle phalanx overriding the proximal phalanx (Lamm et al., J Am Podiatr Med Assoc 91(7):331–336, 2001). The peg and hole technique for PIPJ (proximal interphalangeal joint) arthrodesis, while technically difficult, is a quality procedure that offers stability and good union rates and is effective in treating hammertoe deformities in an elongated digit.